Remember when I got those giant zucchinis from my grandma and wanted to use them all up? 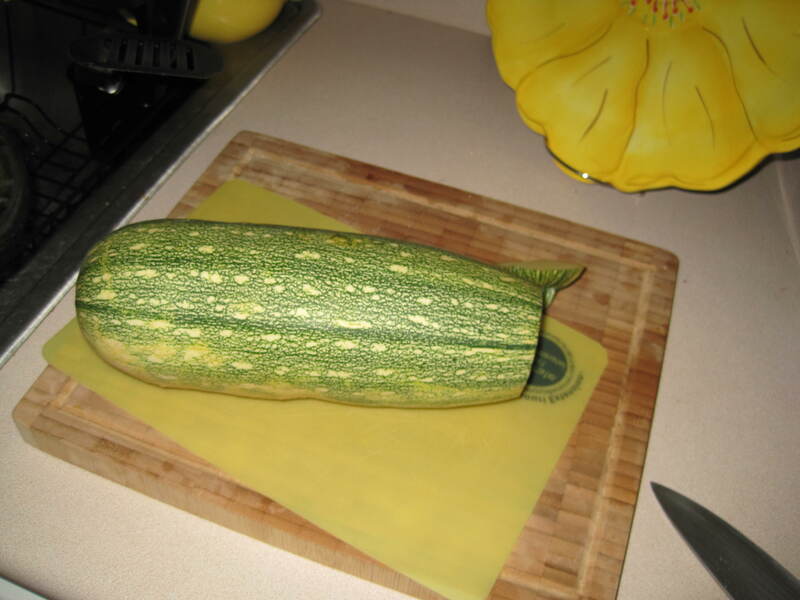 Giant zucchini, how I learned to love you. Now I can't wait for more garden-fresh goodies! Well, that began my love affair, and now, I’m hooked. 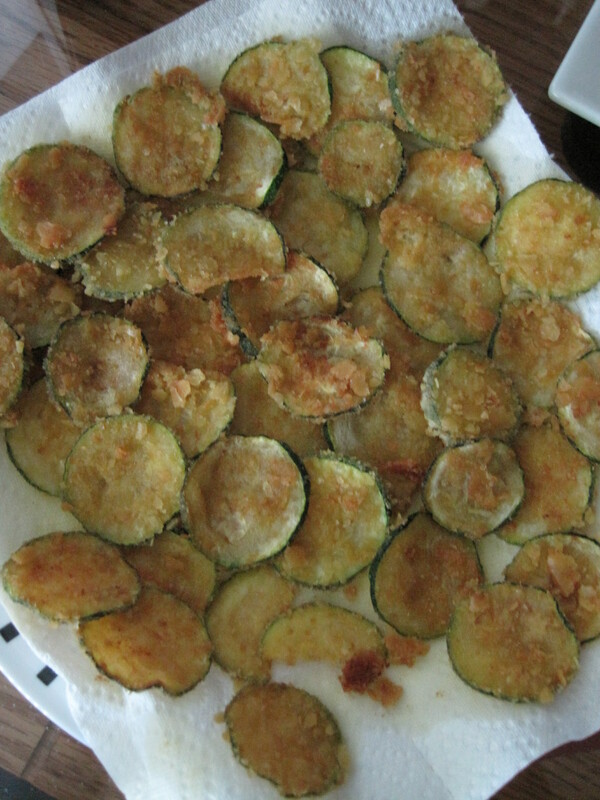 Here’s our most recent zucchini adventures. 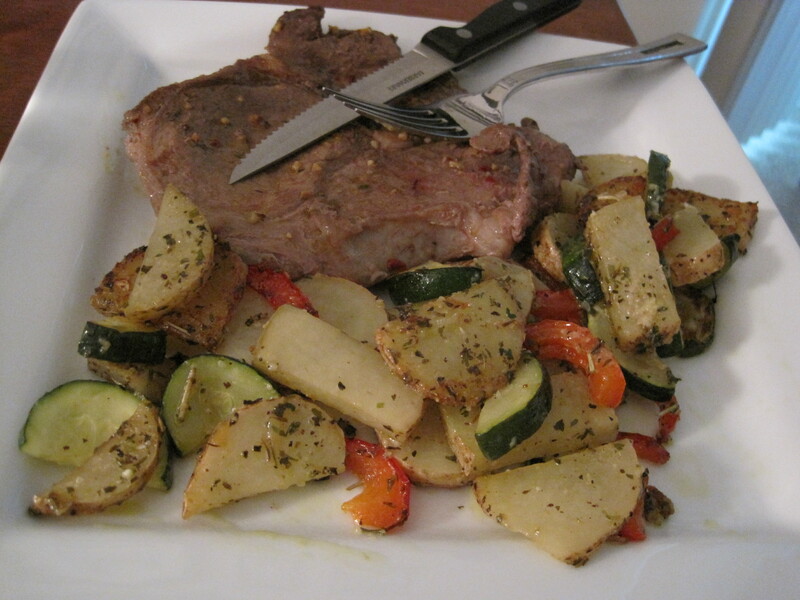 Steak, with potatoes, zucchini, and red peppers, sauted with Italian seasoning. YUM. 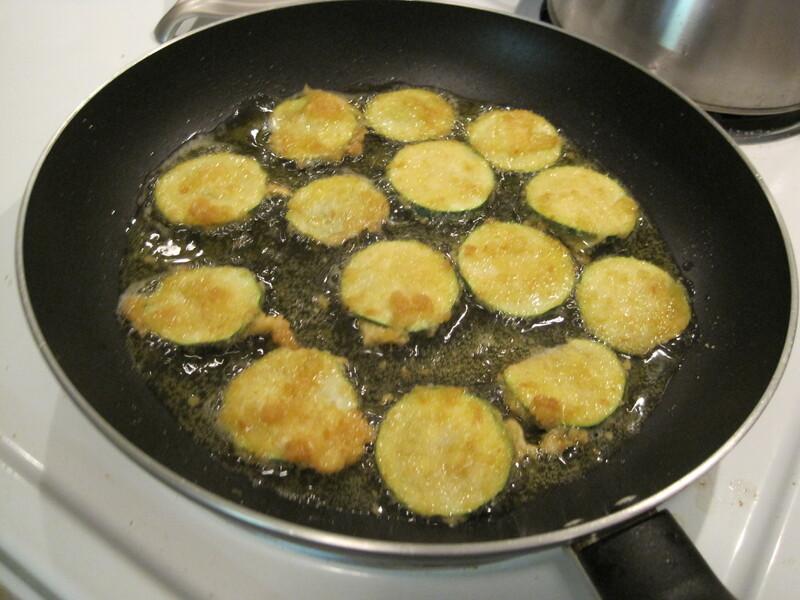 And a bit less healthy, but so yummy, fried zucchini. Start by slicing it pretty thin. About a quarter inch works well for this. Then it’s time for batter. 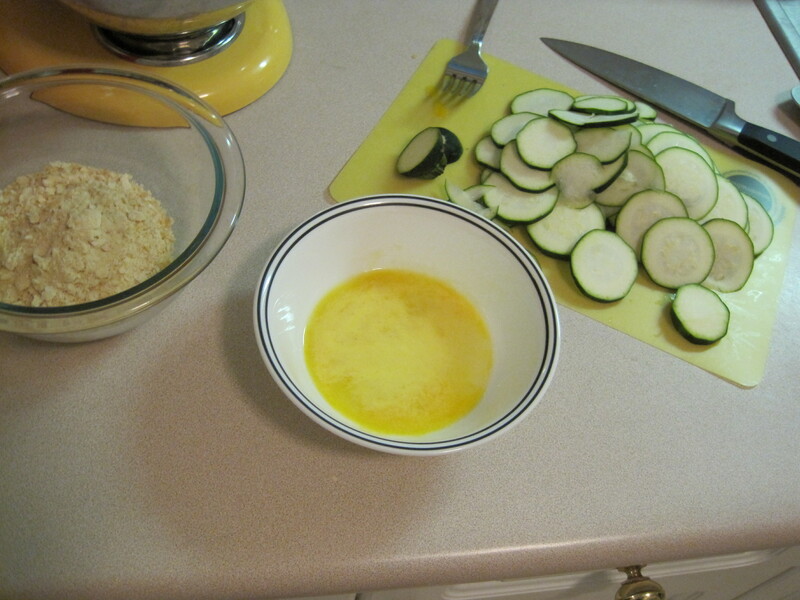 Egg wash and crushed cracker crumbs are perfect and delicious. And then time for frying! Turn then pretty often to avoid burning, especially if you slice them super think and make them more like chips. We also baked some and they turned out good, but I think I’d use a bread crumb base for those to help them get more crispy and golden faster. 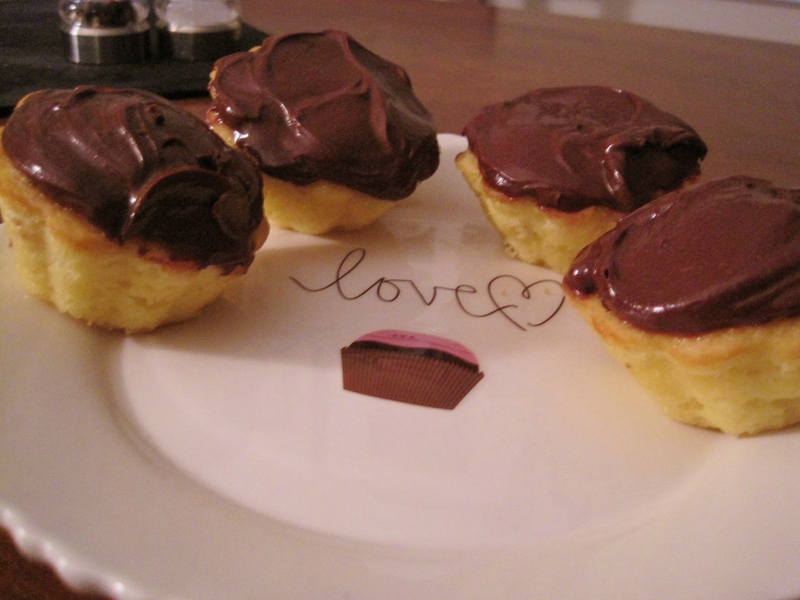 Hubs liked them, too. And how could you not? Zucchini is awesome! Your turn! 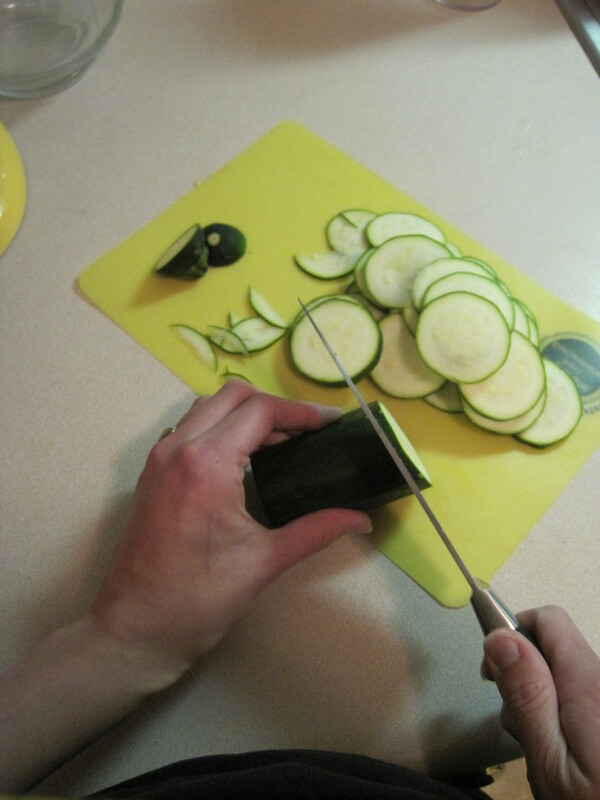 How do you love to cook zucchini? Sometimes, Hubs and I are lazy. Usually though, we’re pretty busy. That’s great, because we love being active and visiting family and friends. But, it means we have lots of long weekends away from home, so sleeping in isn’t usually an option. And sometimes, as newlyweds, our night-time snuggle time interrupts would could be sleeping time. Plus, I have to get up at or before 6am for work since I’m driving more than 35 minutes every morning. Yikes. And that means I yawn at work. Hubs can drink coffee to help wake himself up, but I’m caffeine-free now and am in need of a new way to find a pick-me-up after a long week, or a busy weekend. Advice is appreciated! Let me know what works for you! Well, guys, I’m a bit late posting, but it was a busy weekend so I hope you’ll forgive me. but, I want to finish up the A to Z blogging challenge today so I end on schedule. For X, I’m going to (probably) introduce you to a word. An Xanthippe is a woman who is ill-tempered and often scolding. We have the word today because of Socrates’ proverbially scolding and quarrelsome wife. As I thought about this, it struck me how terrible it would be to leave that sort of legacy on your marriage. When people look at our relationship, I want to make sure that they see a loving, generous, and supportive woman standing beside her loving, generous, and supportive husband. I want to be remembered as a couple that played often, fought fair, and made wise decisions together. And most of all, I want people to see that we love with a love than can only be inspired by the way our Father loves us. What about you? What sort of legacy do you want to leave with your marriage? We’re young and in love. And while it’s true that this young love is happy and exciting and sweet and full of hope for the future, it’s also scary and frustrating and a lot of hard work. Don’t get me wrong, we have big dreams and hopes for our future together. But we also have bills and big questions and a budget to follow that seems to get smaller every week instead of bigger. I’ve decided it’s a fine line between wishes and worry. See, wishes often lead to worry, and the other way around, or at least, they seem to. For example, when we wish for a house with a big yard, we start to worry about the cost of that yard and paying a bigger mortgage. It’s not a crippling sense of worry, or a high level of fear. It’s all about a balance. In fact, the worries help keep me grounded. Because when I wish for a house with a big yard, I start to yearn for acreage and a pond with a long driveway away from the road and away from neighbors. Because yes, it’s free to dream, but no, I shouldn’t focus on things we can’t have because it will make me less likely to be happy with what we find. But, the wishes are important, because they keep my heart happy when I think about the future. Thinking about the practical things, our needs, usually leads me to dream about the future and how things will be different and better for us as we grow and learn and change and have a family. So really, it’s all about taking one with the other. I’m a worrier and a wisher, I guess. Which isn’t such a bad thing if it leads to making better decisions right now for a better future tomorrow. Which will help us get to the future happier, healthier and hopefully with more money in our piggy banks. You know, the traditional storybook ending. And living happily ever after, is all we ever really wanted, anyway, right? What about you? Are you a worrier or a wisher? Remember my post yesterday about our big fight before bed on Monday? Well, last night, we celebrated our victory in overcoming that fight, continuing to learn and love and forgive each other when we fail at communicating with care, and for simply the sake of celebrating. Yum. I'll celebrate love with my love, any day! We know that we’re going to have bad days when we just get on each other’s nerves. We also have days when we are overcome by the awesome amount of love we have for each other. You want to know something crazy? Some days, both of those things happen. That’s something surprisingly wonderful I’ve learned in our nearly ten months of marriage. And I’d say that’s worth celebrating. Life’s about the little things, after all, right? What about you? What do you celebrate and why? Better yet, how do you celebrate? Hubs and I are different. I am a 50% rational and 50% emotional. Usually the rational part wins over, but when it’s time to be emotional, boy, do I get emotional! This can make it hard to communicate. Last night, about 11:15pm, laying in bed. He knew it was fine for bed. I knew it was time for bed, too, but the emotional part of my being won out. I’ll admit there was some crying when Hubs wasn’t really supportive of my need to be cheered up and calmed down. He was rational in that he said I already knew everything he would say to cheer me up. I knew that I knew all those things, too, but I was already too emotional to care about that stuff now. (In Hubs’ defense, he eventually understood that he was going to have to give in and just work me through my emotional-ness, no matter how much he tried to convince me to be rational. So we had a bit of a fight and stayed up later than we should have. And we managed to make up and wake up happy together. Because we understand each other, even when we’re unhappy. *Hubs approved all the percentages estimated in this post. I know it’s a concept that most of us learn when we’re young in regards to sharing toys and games and time on Mom’s lap, which is no fun for anyone. But the idea of taking turns with household chores, and special attention to one another is one that’s been on my mind all weekend. To make a long story, short, this weekend was busy. Friday night was supposed to be “date night in” with meatloaf and potatoes. 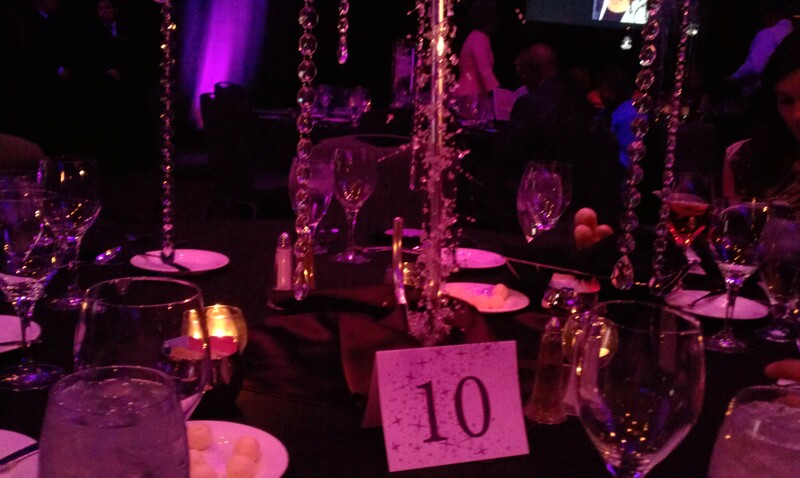 Instead, I found out at about 3:00 that we were headed to a fancy benefit dinner for a charity awards banquet. Wyatt got two free tickets courtesy of his job. It was a super fancy dinner. I felt like a real grown up that night. A fancy grown up in the big, fancy, grown-up city. Did I mention it was fancy? We had cocktails at the open bar, some pretty delicious dinner and a super delicious dessert, and sat back to watch the awards and speeches. 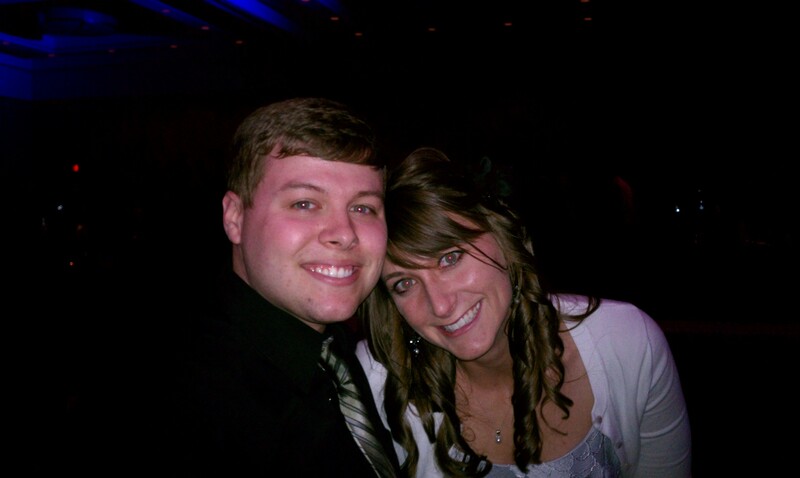 Getting all dressed up was certainly no how we planned to spend the night, but it was fun! We spent the night with some friends from Hubs’ work and had a great time. So at 9:00, we headed to the doctor and got a prescription. Suddenly the weekend went from super fun and busy to a little harder to manage. So we changed gears a little bit and I spent more time on the couch trying to feel better while Hubs got things ready for the rest of the day. There wasn’t time to really rest up, thought, because we had an indoor soccer game around noon, and tickets to the Royals game that night. 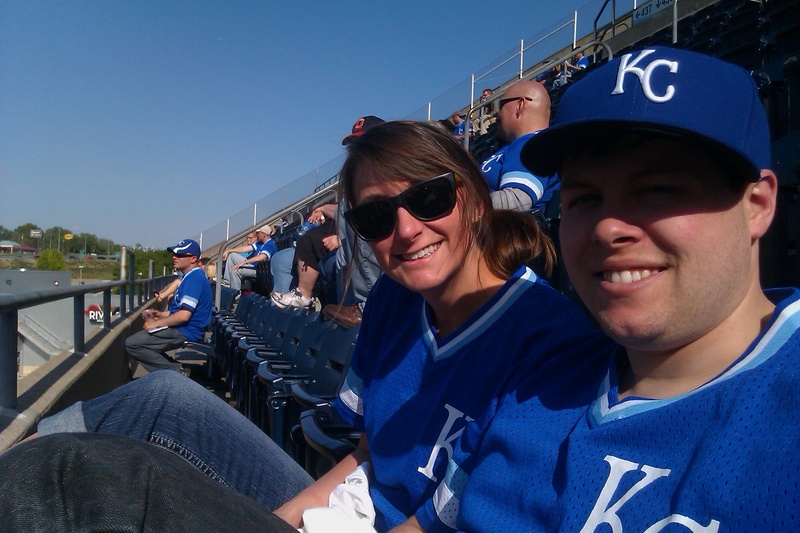 Yup, that's me, in a Royals shirt. Living in KC is certainly proving to be an interesting experience! They lost, which is a bit of a bummer, but we had a good time and enjoyed the sunshine and ballpark hotdogs. We ended up leaving early because I was tired and ready for bed. Sunday I woke up feeling much better than the previous 24 hours, but still not great. We got to sleep a little later, but had to get on the road to Springfield to catch the minor league cardinals game we were planning to enjoy with my sister, brother-in-law, grandpa and cousins. The trip was great, the game was fun, and the day was overall, a fun Sunday. 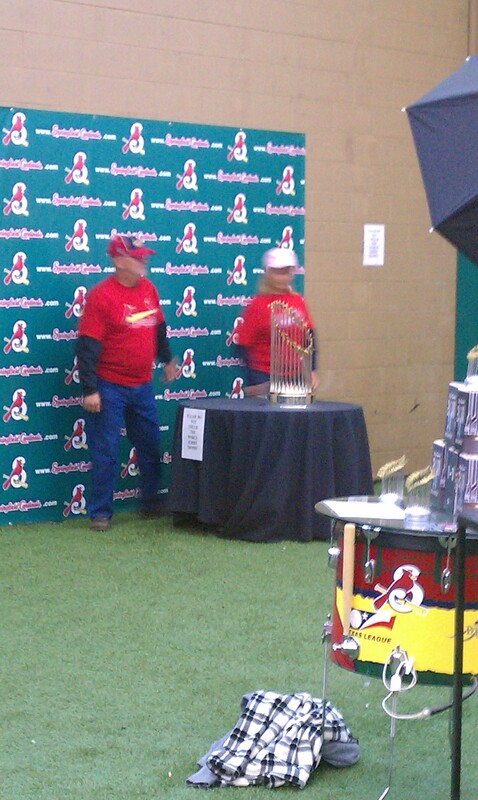 Sorry no pictures of the game, but we did get to see the Cardinals’ World Series trophy that was on display at the stadium for the weekend. Sorry about the random people in the photo, I didn't want to wait in line to see it up close. We made it home at a good time since it was an afternoon game, but there wasn’t time for a grocery trip run (it was supposed to be Friday night after the meatloaf…but that didn’t happen, clearly.) so we had pizza. And we did some house-hunting. And just chilled out on the coach until bed. This morning I woke up feeling better again, but still not 100 percent well, and I’m thankful Job#3 is only three days a week and that I finished most work for Job#1 on Friday. That means I have all day today to rest, clean up our messy home after our weekend craziness, and keep recovering. Throughout the weekend, I was reminded of just how much taking turns has a place in marriage. It was Hubs’ turn to do more laundry, do more kitchen-clean up, and do more taking care of me. He’s quick to hold my hand, help make me to feel better, no matter how much I dislike the medicine or whatever I need to do…and take out the trash. And the best part about marriage is that I don’t have to feel guilty for soaking up his attention and care, because the next time he’s sick, it will be my turn to take care of him. Sharing isn’t so bad after all. Hubs and I don’t have secrets from each other. We’re both very open anyway, and find it easy to talk to pretty much anyone, but with each other, we believe in sharing our lives, completely. It’s helped build trust in our relationship and makes us feel closer, connected, and safe, no matter what we have to talk about. Of course, there are some exceptions…things like what I’m planning for his birthday or that I’m going to surprise him with his favorite dinner when he gets home from work, but overall, and with all the big stuff, we’re honest with each other. If a friend says, “I’ll tell you this, but you can’t tell anyone, even Wyatt,” I’m quick to stop them and explain that I’m not comfortable with that. Does that mean Hubs cares about the juicy gossip I hear from a friend about someone he doesn’t even know? Of course not. But if he doesn’t need to know, there’s a good chance I don’t need to know either. And does Hubs tell me everything he does at work all day long? No, but he could if we had the time or desire to go over details like that all the time. The fact that we don’t have secrets doesn’t mean we know everything there is to know about each other. We certainly still surprise each other every now and then. It does mean that we don’t purposely hide anything that could be hurtful to ourselves, our marriage, or each other. I think this has made a big difference in our relationship. Since Hubs is my very best friend and my favorite person to talk to, he’s the first one I want to tell any exciting news. But it’s a downside that we’re willing to live with. Total trust is totally worth it. Your turn? Do you have any secrets? Can you keep a secret? Or is it hard to hide stuff, even things like birthday gifts, from you significant other? We’re new in the city, so there’s a lot of things we don’t know. Anyway, since we don’t have a ton of knowledge on what’s best for this KC lifestyle, we ask people for recommendations. Is this dangerous? Probably. Because we don’t know what we’re getting when we visit a doctor that a friend of a friend recommended. Or what we’ll find when we visit a restaurant that was suggested by someone we barely know through work. But the way we see it, we wouldn’t have any information about where we’re going anyway, right? And this way, we feel we have something, however small, in common with whatever or whoever we’re checking out for the first time. Of course, we still end up with no clue sometimes. Like when we drive into a neighborhood to check out a house and find the sketchiest-looking neighbors we’ve ever seen. Or when we get lost on the way to whatever new place we’re trying to find. Living in a big, new city isn’t easy. If it wasn’t for Hubs and GPS, I’d be lost all the time, I swear. What about you? How do you find the best places to visit or decide what people to trust in a new place? What’s the best way to ask advice for things like this? We’re going to bed early tonight. Because we need some quiet time together. It’s time to focus on some time for us. Lately, we’ve been busy a lot. House-hunting, hosting guests on our couch, work, job hunting, running races, watching TV, going to soccer games…you know, just enjoying our life together. And all that is great, and we enjoy it. And then we’re going to fall asleep in each other’s arms. I think that’s my favorite part of quiet time… and any day.